3 cups of uncooked rice – preferred is the Cal rose short grain rice as it is typically the Egyptian rice. 5 Pita bread pockets cut in squares – preferred the Whole grain one. You can make your own. 1 Tbsp minced garlic cloves. 2 – 3 Tbsp of white vinegar. 2 tsp of tomato paste. 1 (15 oz) can of tomato sauce. 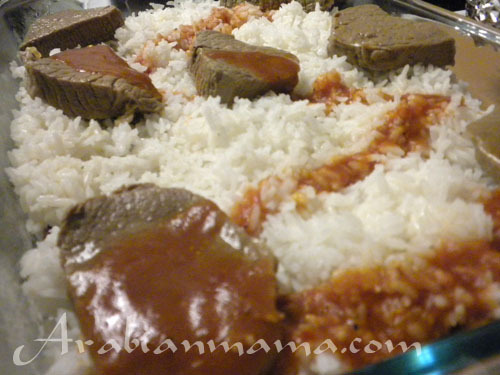 Boil meat or put it in the oven – the traditional way is boiling- until fully cooked. In a pan over medium heat, melt the butter then add the pita pieces. Stir until the pieces are crispy and golden, lower the heat and make a well in the bread. 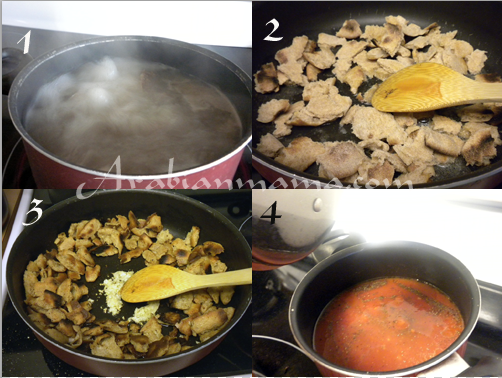 Add minced garlic in the middle then when it is golden add the vinegar and mix them all together with the bread pieces. In a sauce pan over medium heat melt the butter ,saute the garlic then add the tomato sauce, tomato paste, salt and pepper to taste. Assemble fattah right before you are ready to eat. In a 13×9 Pyrex arrange the bread pieces in a layer then top with rice – not necessarily the whole amount just add rice to your likeness . 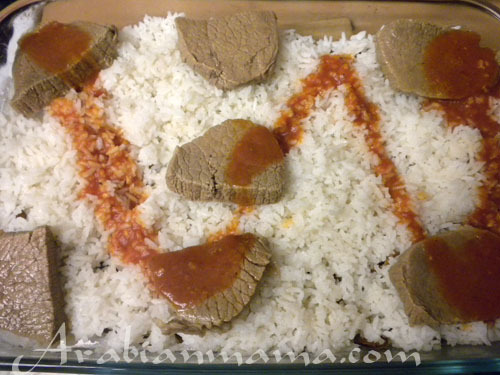 Arrange the meat on top of the rice and garnish with some sauce. Traditionally, after bread is layered we soak it with beef stock then complete with rice and meat. Frankly I do not like it as the bread becomes so soggy and I do not like that taste I prefer it crispy and dry hence I serve the dish with more beef stock and sauce on the side for those who like it the traditional way. I hope you liked our Egyptian Fattah. EID mubarak! 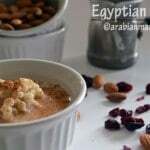 was looking for an easy recipe for Egyptian Fattah and here it is! Thank you. 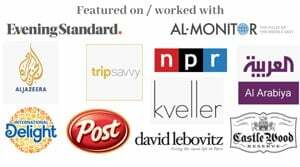 I subscribed to your recipes although never comment (I really should, your recipes are great!). Cant wait for this to be ready for my family after Eid prayer tomorrow. Again thanks for a great recipe in a pinch. Eid Mubarak to you too my dear, may all your prayers be answered In Shaa Allah. Thank you for your sweet comment, nothing makes me happy more than someone tried a recipe and liked it , it is a pleasure for any food blogger. I hope you and your family liked the fattah as well :)). How yummy – the fattah I have had is the Syrian one which is totally different – I feel like I am discovering a whole new world of food through you!